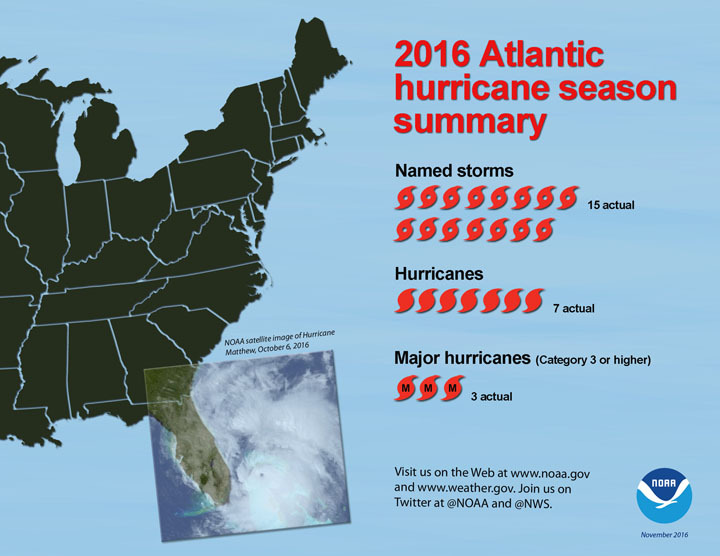 FLORIDA – The 2016 Atlantic hurricane season officially ends today as the first above-normal season since 2012, according to the National Oceanic and Atmospheric Administration (NOAA). There were 15 named storms during 2016, including 7 hurricanes (Alex, Earl, Gaston, Hermine, Matthew, Nicole, and Otto), 3 of which were major hurricanes (Gaston, Matthew and Nicole). NOAA’s updated hurricane season outlook in August called for 12 to 17 named storms, including 5 to 8 hurricanes, with 2 to 4 of those predicted to become major hurricanes. Several Atlantic storms made landfall in the Caribbean this year, including Hurricane Earl in Belize and Hurricane Matthew in Haiti, Cuba, and the Bahamas. The strongest and longest-lived storm of the season was Matthew, which reached maximum sustained surface winds of 160 miles per hour and lasted as a major hurricane for eight days from September 30 to October 7. Matthew was the first Category 5 hurricane in the Atlantic basin since Felix in 2007. It intensified into a major hurricane on September 30 over the Caribbean Sea, making it the first major hurricane in that region since Poloma in 2008. 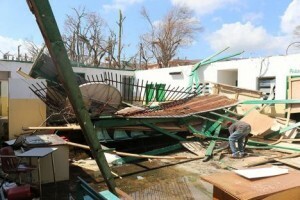 It made landfall as a Category 4 major hurricane in Haiti, Cuba and the Bahamas, causing extensive damage and loss of life.